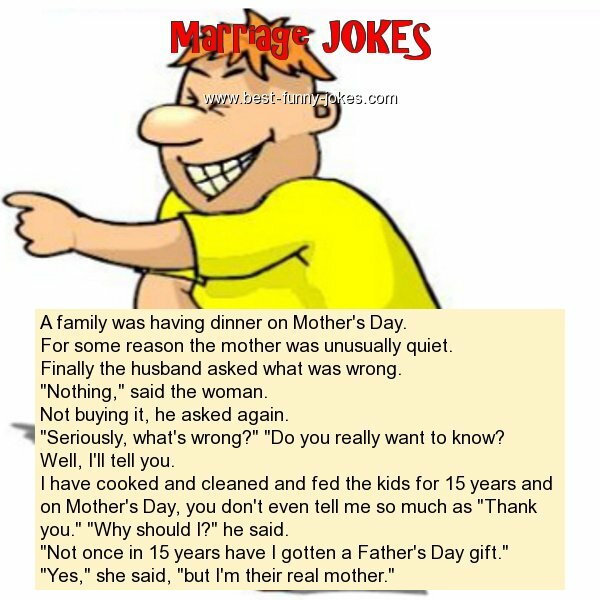 A family was having dinner on Mother's Day. For some reason the mother was unusually quiet. Finally the husband asked what was wrong. Not buying it, he asked again. "Seriously, what's wrong?" "Do you really want to know? I have cooked and cleaned and fed the kids for 15 years and on Mother's Day, you don't even tell me so much as "Thank you." "Why should I?" he said. "Not once in 15 years have I gotten a Father's Day gift." "Yes," she said, "but I'm their real mother."